2. Saute the onions till soft. 3. Transfer to a soup pot and add the cumin and oregano. 4. Stir well and add the vegetable stock. 5. Add the tomatoes and tabasco sauce. 6. Cover with a pan and bring to a boil. 7. Reduce the flame and simmer for 5 to 10 minutes. 8. Puree the tortilla chips with 1 1/2 cups of hot stock and pour it back to the pot. 9. Stir well and serve hot. Tip: Garnish with a little crumbled chips. 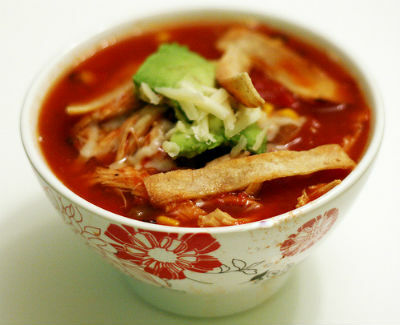 Feel free to comment or share your thoughts on this Tomato Tortilla Soup Recipe from Awesome Cuisine.